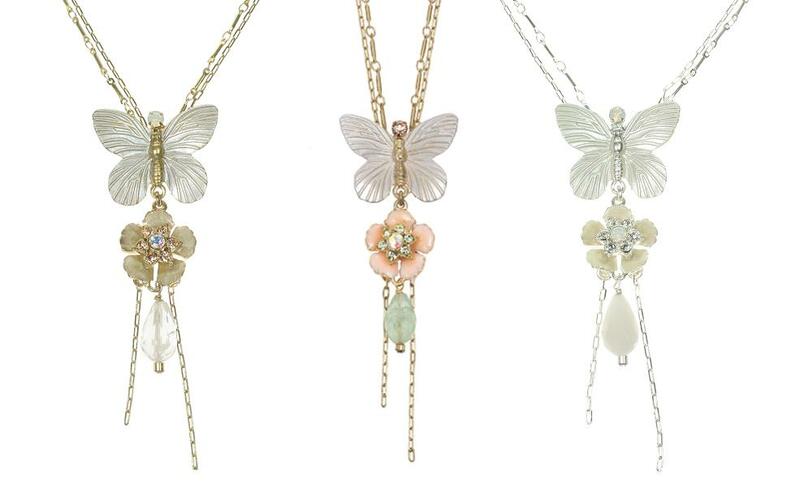 This series mixes a stunning array of metal, glass and crystal beads with butterfly and leaf charms to achieve this very pretty feminine range. A variety of enamelling techniques have been used including butterflies that are finished in matt silver enamel and flowers with shimmering gloss. Available in browns/gold plate, pastels/gold plate and white/silver plate colourways. Stunning charm corsage stretch bracelet. Featuring a feast of botanical motifs: an enamelled flower with Swarovski crystals, butterfly decal shell disc, matt metal butterfly, and various leaves and faceted crystal quartz beads. Smallest bead 5mm largest butterfly 2cm/20mm. It stretches to fit. Unstretched inner circumference 18cm/ 7 inches. Stunning corsage adjustable bracelet. Featuring a feast of botanical motifs: an enamelled flower with Swarovski crystals, butterfly decal shell disc, matt metal butterfly, enamelled winged bird, and carved shell flower. Smallest motif 2cm/20mm largest 3cm/30mm. Adjustable length 19cm/7.5 inches upto 24cm/9.5 inches. Stunning charm earrings. 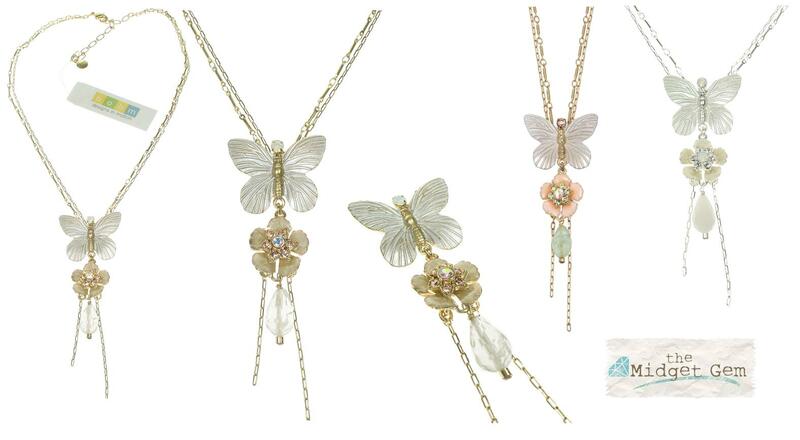 Featuring a feast of botanical motifs: enamelled flowers, matt metal butterflies, and faceted crystal quartz beads. Smallest bead 1cm/10mm largest the flowers 2cm/20mm. Hook fastener for pierced ears. Total length 6.5cm/65mm. Pretty adjustable trio-pendant necklace. Pendant is 9cm/90mm long.Butterfly is 3cm/30mm wide. Double strand chain. Adjustable length 41cm/16 inches to 48cm/19 inches. Pretty adjustable 'Y' necklace. Features a stunning array of charms and beads. Largest bead is a quartz drop 2cm/20mm. Length of front drop 6cm/60mm. Double strand chain. Adjustable length 41cm/16 inches to 48cm/19 inches. Pretty adjustable pendant necklace. Pendant is 5cm/50mm diameter. Lots of details: Swarovski crystals, enamel, mother-of-pearl flower and glass beads. Snake style chain. Adjustable length 41cm/16 inches to 48cm/19 inches. Stunning M.O.P charm earrings. Featuring a beautiful craved mother-of-pearl flower with Swarovski crystals, pearls, glass beads and matt metal leaves. Smallest bead 5mm largest the flowers 1.5cm/15mm. French clip fastener for pierced ears. Total length 6cm/60mm.